HALF BRONZE ROOSTER Tail Feathers. 3" Pack Of 6" - 8" in Length. 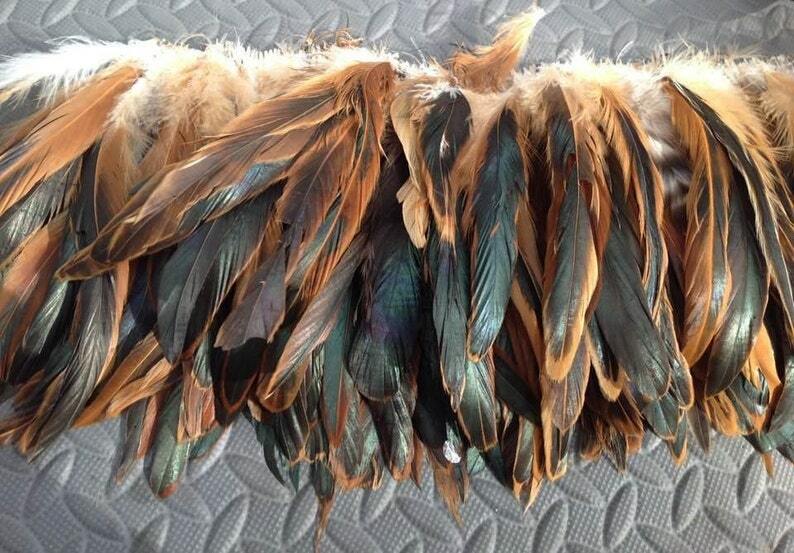 You can use these feathers for Tahitian Headpiece's or for any costumes. Please choose which color you would like. You will receive 3" of strung rooster tail. MEASUREMENT--The feathers measure 6" - 8" in length. Please let me know if you need a larger quantity than what is listed. Dyed SEA GREEN Rooster Tail Feathers.. 3" Pack Of 8" - 10" in Length. Perfect For Making Headpiece And Costumes!! Dyed Golden Yellow Rooster Tail Feathers.. 3" Pack Of 14" - 16" In Length. Perfect For Making Costumes. CUT PEACOCK EYES 8" - 10" Long. Tahitian & Cook Islands/ Rarotongan Headpiece.. Rooster Tail Feathers, Black FW Pearls, MOP Shells Headpiece. Perfect For All Ages. Tahitian & Cook Islands/Rarotongan Authentic Tapa Cloth, Lauhala, Niau And Rooster Tail Feathers Headpiece. Perfect For All Ages! !